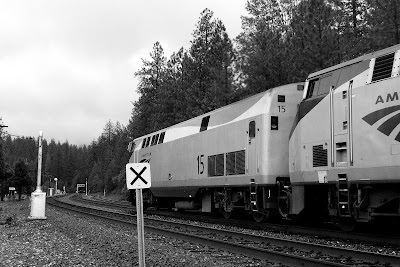 Here, Amtrak #6 east, on the current California Zephyr route, has passed Gold Run and is upon the lower Dutch Flat crossing. 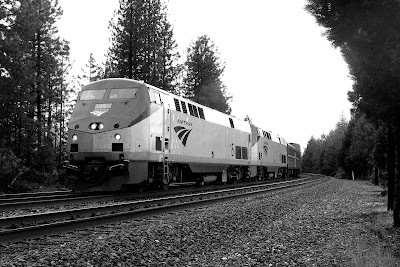 The current Amtrak Zephyr runs two trains daily (one east, uphill over the Donner Pass -- and one west, downhill from Donner) between Emeryville, California and Chicago, Illinois. The westbound Zephyr is known as Amtrak #5, and the eastbound Zephyr is Amtrak #6. Amtrak is actually the National Railroad Passenger Corporation, a for-profit corporation created by the US Congress in 1970 and incorporated into DC in 1971. Amtrak makes little money on its own, with the exception of the so-called Northeast Corridor -- the busiest rail line in all the US -- predominantly to and from Washinton to Boston, and including Baltimore, Wilmington, Philadelphia, Trenton, Newark, New York, New Haven, and Providence. It also has branches connecting Philadelphia with Pittsburgh, Pennsylvania (known as the Keystone Corridor); New Haven with Springfield, Massachusetts (known as the New Haven–Springfield Line); New York City with Niagara Falls, New York (known as the Empire Corridor), and several other commuter destinations. The busiest passenger rail station in the United States is Pennsylvania Station in New York, the central hub of the Northeast Corridor. Amtrak and its subsidiaries is largely funded by the federal government. Other smaller and localized lines -- including those in California -- are co-funded by local governments as well. If not, however, for federal funding then Amtrak would have perished on the vine quite some time ago. Amtrak's service site is here, if you wish to book trips or tickets. Amtrak, as I have observed over the years, is spotty and "hit and miss" at best. Yes, I must admit, there have been a consistent two Zephyrs per day; one east, one west. But if you expect the Zephyr to be on time and conform to its timetable, then -- ahem -- perhaps you'd best adjust your personal schedule. I have found that the CZ can run from a half hour early to -- mostly -- up to two hours late in Colfax and Truckee (in California). I make this comment not in terms of theory but in terms of direct observation. I live in the mountains, directly on the route. In the early 2000s, their Amtrak Express freight service was huge. This was clearly an attempt by Amtrak to take whatever time-sensitive freight traffic it could away from Donner Pass owner Union Pacific -- itself still recovering from the transition from Southern Pacific to UP. This was an attempt to steal as much LTL (less-than-truckload) business as possible. It was nothing, in the early 2000s, to see three GE passenger locos pulling a medium-sized passenger train attached to a minimum of five to eight freight cars at the end -- and perhaps a roadrailer or two. Those days have quite passed. Most of that business was lost in 2004. Now, Amtrak equipment is beaten, battered, bruised, rumpled, dented and fading. Even during a Democrat administration -- the most favorable possible in DC for Amtrak -- little has changed. Ridership for a time was up for the Zephyr, just prior to the current economic bust. These days, the locomotives on point show their road scars, as do the baggage cars and double-level passenger cars. Here, Amtrak # 15, in the newest Amtrak paint scheme, is a GE Dash9-P42B sporting 4,200 hp and manufactured by General Electric in 1996. Twenty such units were purchased by Amtrak. The Dash9-P42B is a diesel-electric DC-driven traction motor unit -- part of the GE Genesis series of locomotives built in response to Amtrak specs for passenger power. This locomotive meets every clearance requirement by Amtrak on every Amtrak route. If you ever hear a series of Amtrak GE P-42s approach for a station stop, you'll notice that, unlike freight locomotives at a stop, they maintain a minimum level of rpm's. That's to ensure that the HEP (head end power) supplies continuous electrical power to the trailing passenger cars for HVAC, cooking and accessories. In second place, elephant-style, is GE Dash9-P42B #67, manufactured in 1997, also with 4,200 hp, one of 100 purchased by Amtrak. 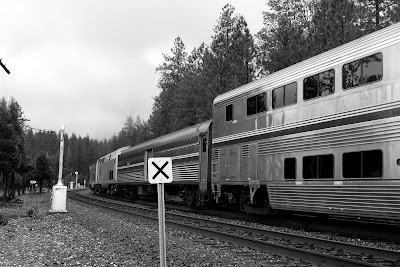 Following is a baggage car, with Superliner II Transition Sleeper Car #39011 next in line. The "X" in the photos, by the way, is called a "whistle board." It is there that the engineer should begin sounding the horn for upcoming crossings. Interesting information. The place they pass each other in Colorado should make a good photo. The few times I've been able to be there, one has been behind schedule. Someday. My post of five years ago here as it relates to your post. The law about trains blocking an intersection for more than 15 minutes no longer exists, to my chagrin. (If I disconnect the air line, does it disable the train?) Of course, I WOULD NEVER DO SUCH A THING! The Amtrak stops in our town twice in each direction daily, (one train is State subsidized). We'd love for it to be economically feasible... it's an enjoyable five hour ride to my wife's home town. But the one-way fare to get there pays for gas both ways in a car filled with people, and you don't have to rent a car or depend on relatives for transportation once you arrive. It's sad and depressing to see the train pass by with two coach and a cafe car, all virtually empty. 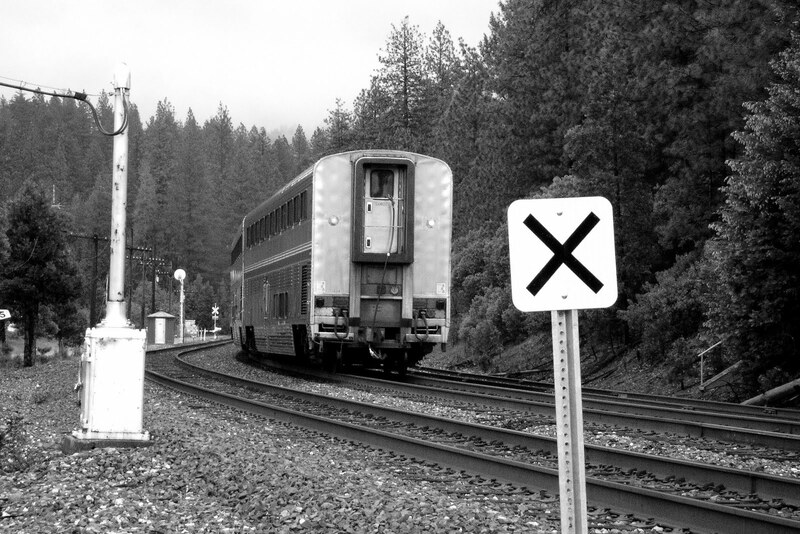 WSF: I must admit, however, that taking a train trip is still a lot of fun. I live literally a couple hundreds yards away from the main #1 & #2 Donner Pass track and can hear the trains during the day and the night. 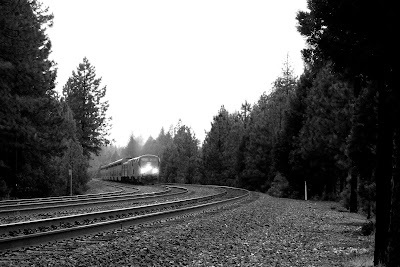 I've taken Amtrak from Colfax to Sparks, Nevada, over Donner, past Donner Lake, in the winter, whilst snowing. It was simply stellar. Greybeard: Amtrak certainly has its problems. Try finding food on a train. GFL. And the times are almost always off; track work on freight lines makes for many delays. One consolation up here is that the seven to eight coaches and cars are still at least half full. I enjoy seeing that. With regard to highway blockage, the situation is much better, at least in my area. In fact, Union Pacific in concert with Reno and the State of Nevada recently completed a trench "under" Reno so that Amtrak and other freights would not block multiple intersections in that gambling town. Traffic now flows freely and Amtrak, when it stops in Reno, blocks no one now. That might be a good topic for an upcoming post: photos of that trench in Reno.